Bio-dynamic 1.5% Fat Light Milk is made with certified bio-dynamic organic reduced fat milk produced from cows that graze on lush South Australian bio-dynamic natural pastures, with no genetic modification, no preservatives or anything artificial added. This non-homogenised light milk contains 50% less fat than the Paris Creek Farms’ Full Cream Whole Milk. Certified Bio-dynamic Organic Reduced Fat Milk. CONTAINS MILK. 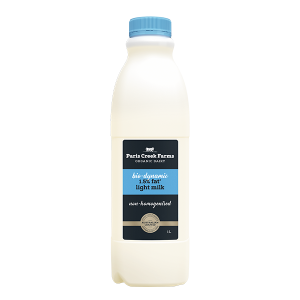 Non-homogenised and Pasteurised Reduced Fat Milk. 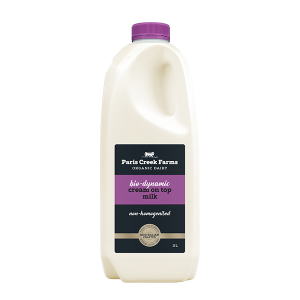 +Contains 50% Less Fat than Paris Creek Farms Full Cream Whole Milk. My 13 month old daughter never ate much for breakfast until I started to cover it in your blueberry yogurt. Now our tiny little lady is finally eating the amount that she is meant to. Thank you for making such delicious products and amazing vego cheeses. The fact that it’s organic, affordable, SA owned/operated and healthy is just the icing on the cake. You have a customer for life.